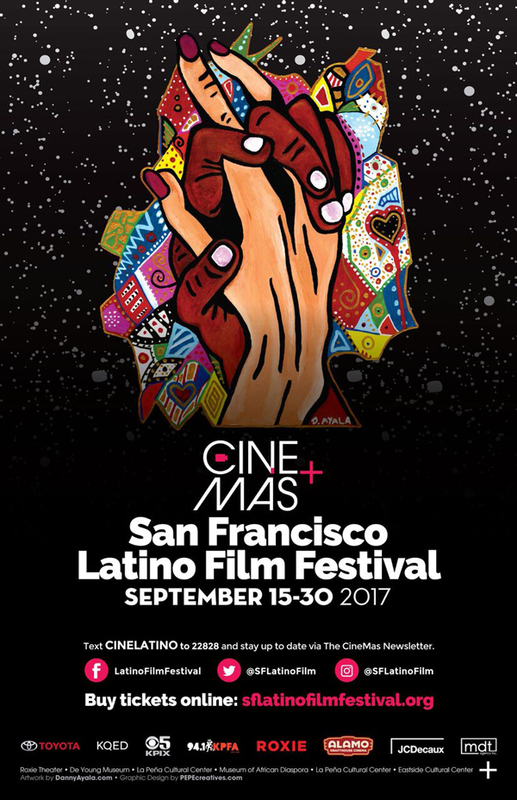 The SF Latino Film Festival is ready for its 9th annual September events, celebrating independent film from the Americas and Europe. Its goal is to showcase film by, about or made with Latinos—to shine a light on inclusion. The upcoming event series is scheduled Sept. 15-30 in SF, Marin, Berkeley and Oakland. Lu Ramirez, the festival director has scouted more than 50 films from the Americas, the full lineup can be seen here: http://sflff.gala-engine.com/2017/ with full descriptions, trailers, filmmaker bios and more. The SFLFF programming committee has selected a range of award winning narratives and documentaries along with a promising group of films from entries we received from campaigning online. The festival opens Sept. 15 at 7 p.m. at Alamo Drafthouse in San Francisco's Mission District. The opening night party takes place afterwards across the street at the historic Grand Theater which is now occupied by local arts org, Gray Area. Other Bay Area locations include Landmark Theaters Opera Plaza Cinema, Roxie Theater, Koret Auditorium at SF Public Library and others listed here: http://sflff.gala-engine.com/2017/venues/. More is added to our gala pages daily as we get closer. “The mission of the festival is to showcase works from all over the Americas as a way to bring international cinema to the spotlight” festival director Lu Ramirez said. Attending directors, adding more daily. Follow on Twitter for additions. Director Maru Buendía-Senties, "Windows" Q&A Sept. 17 7 p.m.
Director Daniel Chávez Ontiveros, "The Swan Kick Off" Sept 7 - KPIX / CBS Studio Sept 7 5:30 p.m.-8 p.m., Opening Night Film & After Party Sept 15 7 p.m., Opening Night After Party Only Sept 15 9 p.m., Screening of film for Q&A Chilean Night Film "Little White Lie ", Roxie Theater Sept 23 8:30 p.m. and After Party 10 p.m., Chilean Night Film Screening only- "Little White Lie," Roxie Theater 8:30 p.m., Closing Night After Party - X Bar - Sept 28 9 p.m.
Director Arlan Parsa, The Way to Andina Q&A Opera Plaza Cinema Sept. 16 1 p.m.
Gini Chavez curated a special section at SF Public Library to showcase historical contributions of the divas of the golden era of Mexican Cinema: first Latin woman to win a Golden Globe (Katy Jurardo in High Noon), Mexican Spitfire's 75th anniversary, and iconic Maria Felix films which can be seen here sflatinofilmfestival.org/2017/08/divas-of-the-golden-era-screenings/. The films screen Monday 25 between 12PM-5PM, free, in Koret Auditorium which seats 250. Poet laureate and Latino literature professor, Alejandro Murguia, will say a few words about Lupe Velez and the Mexican Spitfire series as well, with more speakers to come. The SF Latino Film Festival is a 501 C non-profit organization. Outside of their signature event each September, they host monthly screenings and collaborations with other festivals in San Francisco, including: Berlin & Beyond Film Fest, SF Int’l Film Fest, SF LGBT Film Festival, SF Jewish Film Fest, SF Flamenco Festival aside from promotional early screenings of mainstream films. Go to sflatinofilmfestival.com for more.